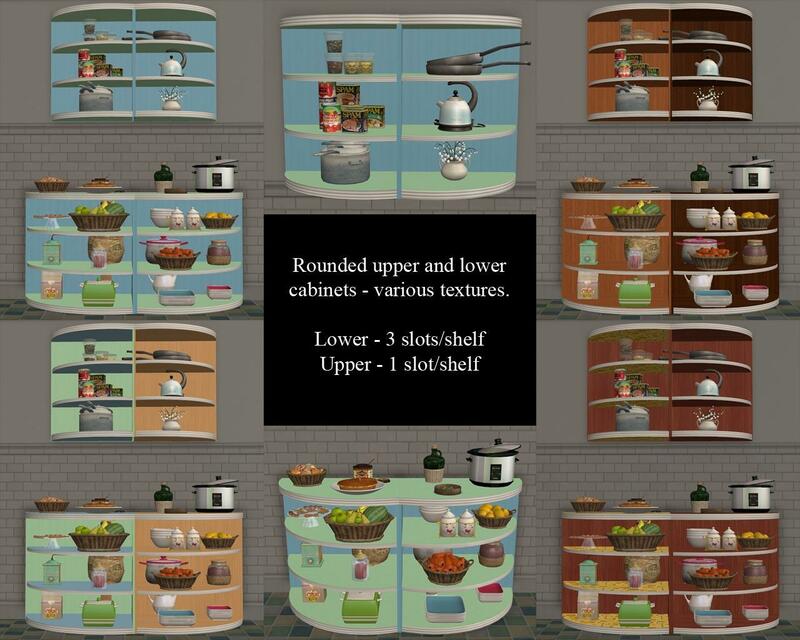 Complete kitchens with matching and coordinating items. 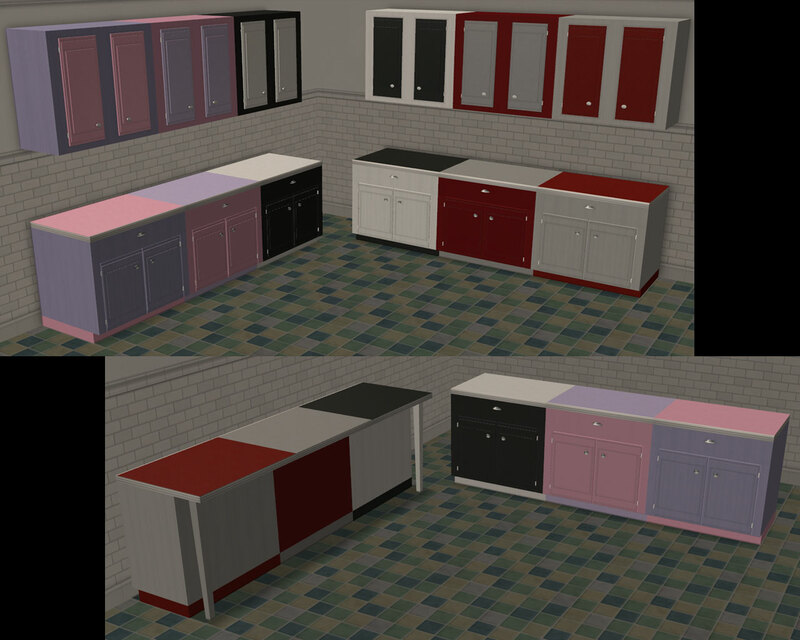 There has been one report of a lot crashing if Maxis dishwashers or trash compactors are used with this set and the lot is saved. While working on this, I didn't have any problems- and I did have a test lot that was saved. However, since the set has been up I have had a lot crash too. I will be looking into this and try to get it fixed. In the meantime- I suggest using a sink and garbage can or the garbage chute to be safe. Thank you for telling me about this. And I'm very sorry for any inconvenience this may cause/has caused. This whole set came about because I had a table and chairs. A table and chairs that are slaved to Buggybooz' Kitchen Basic. I promised myself I'd do a non-slaved version of that little set. The I got to thinking that a table and chairs needed a counter. If you've got a table, chairs and a counter- you need an island. So my promise to myself kind of blossomed into a whole new kitchen. Why retro meets modern? The meshes, original color and recolors are very retro looking. 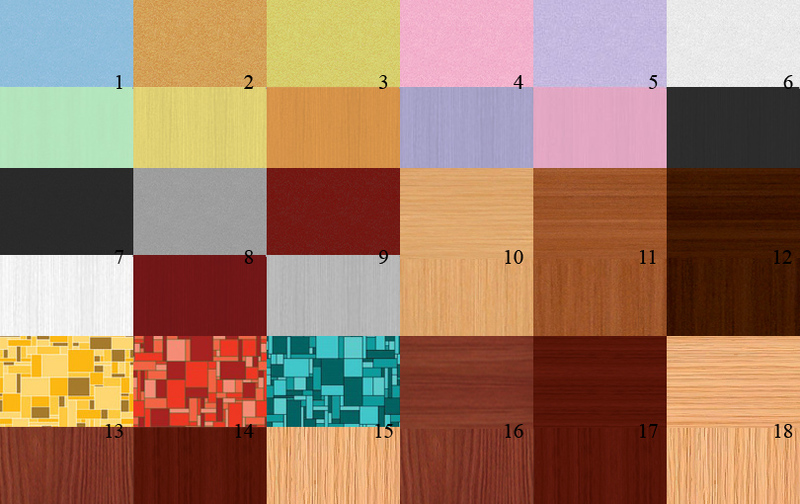 While checking them out in game, I realized that there were no regular wood colors- me being me, off I went to recolor some more. 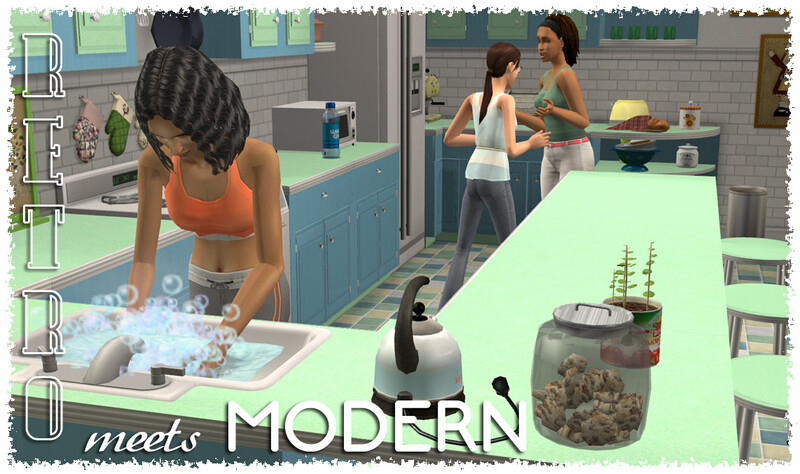 I noticed that these meshes looked a lot different wearing Maxis-wood-texture clothing- so retro meets modern was born. 17 meshes & 18 recolors. See pics for the meshes and recolors. I was playing with the recolors- you can get a lot of different looks with them. And I mean A LOT. Play around with them and you'll see what I mean! There are 5 shelves in this set. 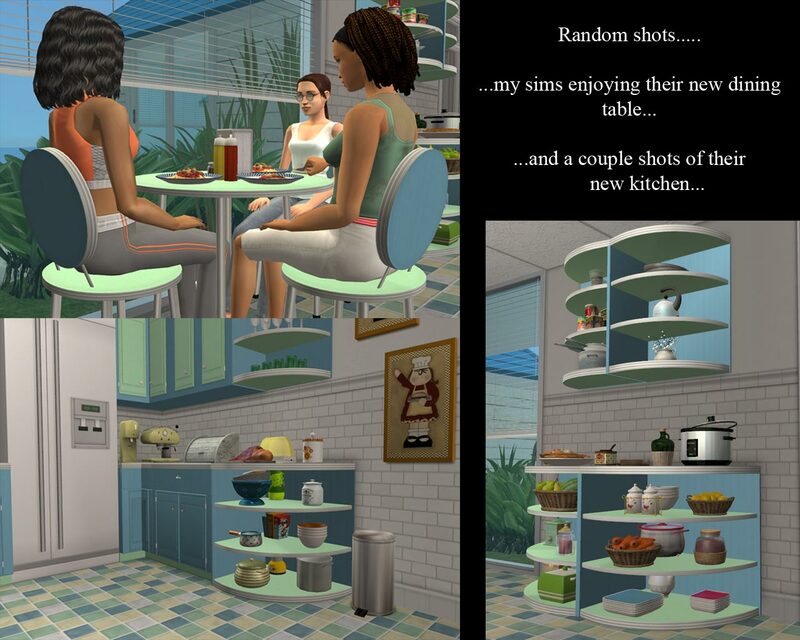 All of them have slots- the larger shelves have 3 per shelf, the 2 smaller wall shelves have 1 per shelf. This set uses the repository technique. The counter is the MASTER so you must have that in game for any of the other meshes to work. 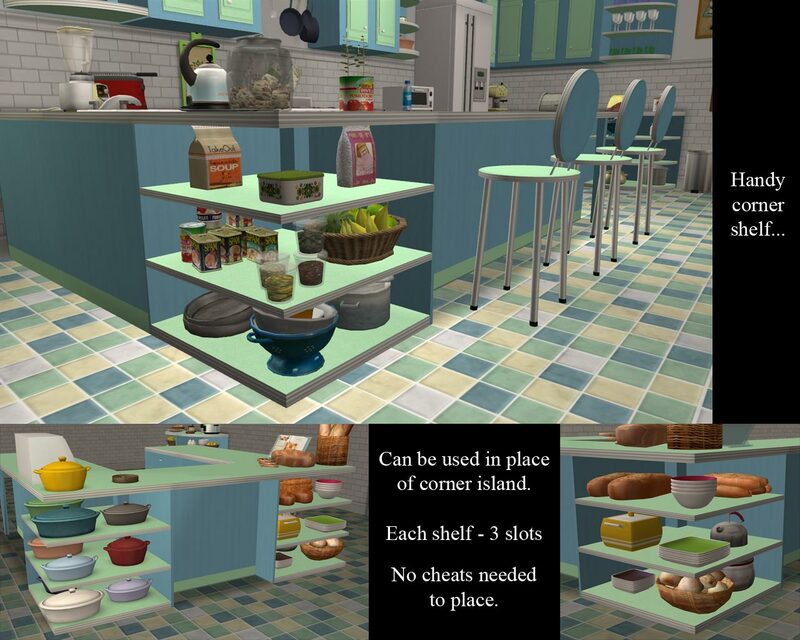 Also- counter and island shadows are funny creatures. Since mine didn't want to behave and show up properly I had to work around them. 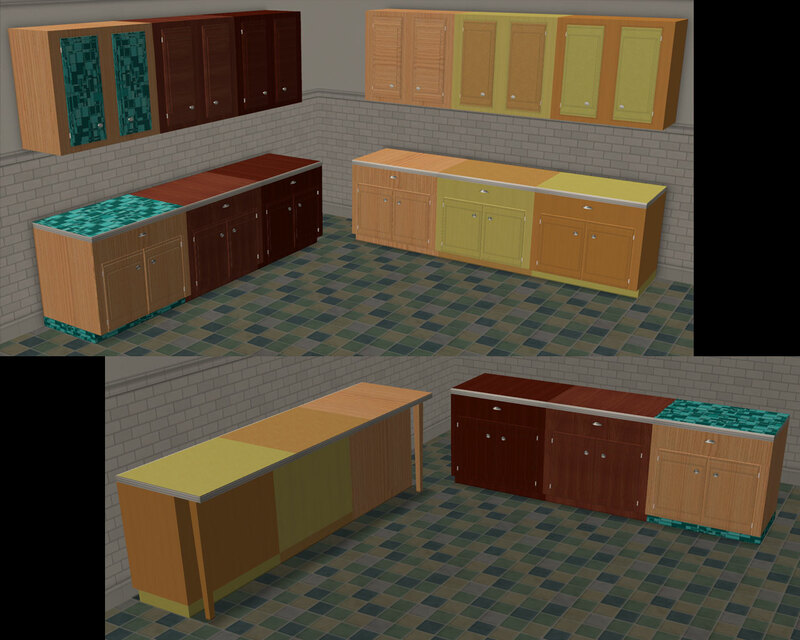 So- the counter wall shadows are slaved to the UPPER CABINET wallshadow. The corner island groundshadow is slaved to the CORNER ISLAND SHELF groundshadow. So you have to have those 2 meshes in your game or you will have blinking shadows. Sorry about any inconvenience this might cause- I really did try to get them to work without slaving them to anything else. There is a metal trim on all of the meshes. Adding the trim to some parts warped the countertop, which caused problems. After spending a couple of days trying to fix that- including doing the trim separately, I gave up and made a piece of trim for the backs of the counters (if needed) and islands. There is a screenshot showing this- you have to have the green "footprint" facing away from the back of the counter/island to place this trim. Then it will go into place with no cheats and in the right spot. There is also a piece of trim for a counter with a sink- placing a sink made the trim disappear no matter how I added the trim. You don't have to use the trim but I do recommend using it. It's part of the "retro look" of this set! The front trim is higher poly than the back- this is because it has 3 sides. If you're wondering about the 3 tables: the 2x2 with the doors on the base is the original table. 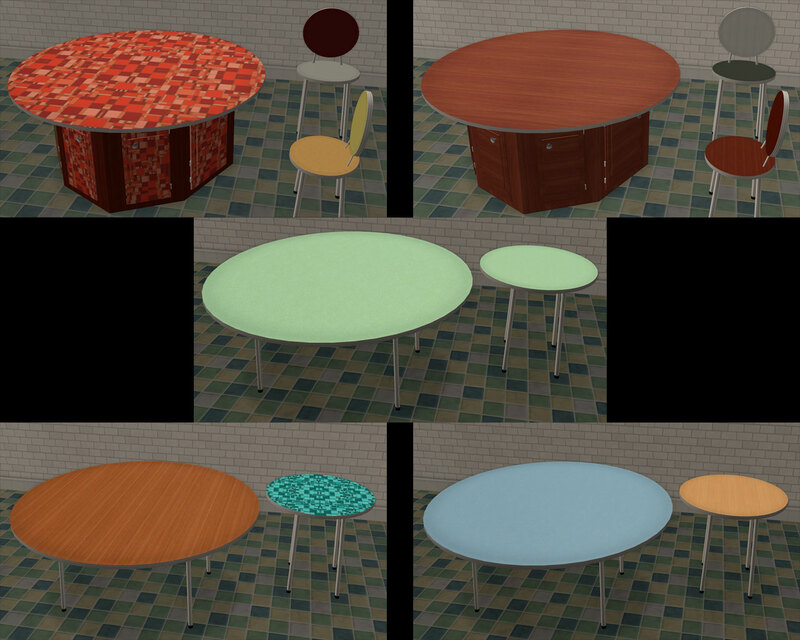 After I got more of the set done I wanted a plainer table, which is how the other 2 came about. Since the original big table was done I included it. If you don't want any of the tables, just delete them from your download folder. In the above pic with the corner island shelves- putting 4 together like that WILL leave a "hole" in the middle. I covered it up using a deco object on an OMSP. MilkShape, SimPE, PhotoShop CS2 and Numenor for the counter templates. 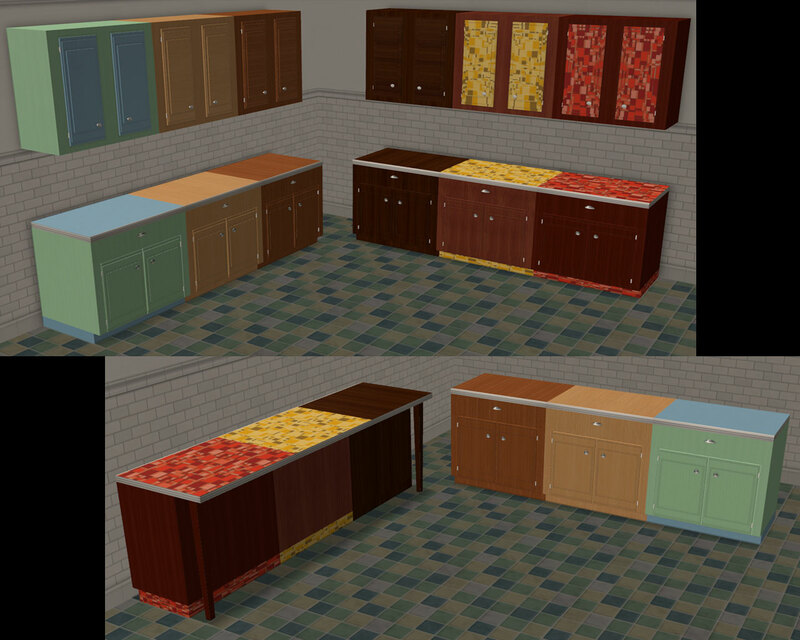 MLC-RetroKitchen-Recolors.rar | Description: Recolors only.